Images courtesy Olle Cornéer. Used by permission. If you think culture has become too disconnected from the Earth, “Harvest” and the Terrafon instrument surely count as a shock to the system. A traditional ensemble picks up an enormous tone arm and transducer and, through back-breaking labor, drag it across arable fields. It’s part sound art and performance, part agriculture. But it certainly counts as a gramophone – it’s just a really big one that reads the grooves of the earth. Beat juggling with two of these I’m guessing is largely out of the question. 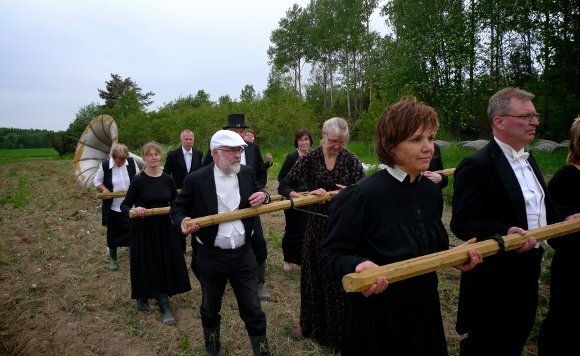 Harvest (2009) is a new art piece for the new instrument terrafon, traditional ensemble and cropland – by Olle Cornéer and Martin Lübcke. In this performance Alunda Church Choir, conducted by Cantor Jan Hällgren, plays the soil of northern Uppland (in Sweden) on terrafon. Harvest by Alunda Kyrkokör was exhibited at the Volt Festival in Uppsala the 6th of June 2009. 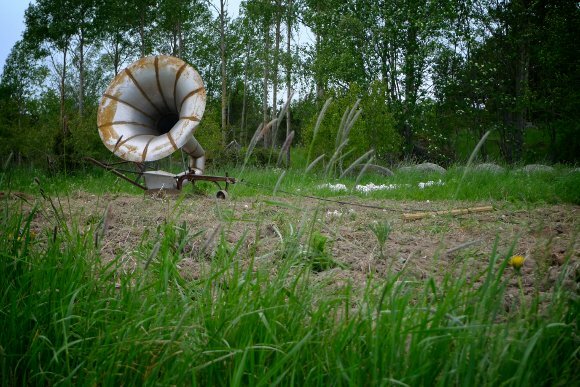 Terrafon is a large agricultural version of the horn gramophone, amplifying the sounds in the track it ploughs. Public Epidemic No 1 from Olle Corneer on Vimeo. Every cell listens to its surroundings and picks up sounds, trying to play together in a musical way. The musical material comes from the background noise, people talking or sounds played by other cells. pulse – the cell dies and is reborn with a new, hopefully better, set of DNA. It’s nice to me that, while these works are both conceptual, you might not guess they came from the same team. I wonder what will come next.